What is the Toast++ Matlab toolbox? MEX files which provide Matlab functions that link directly to Toast library functions. M files that provide additional high-level functionality making use of Matlab numerics and visualisation routines. 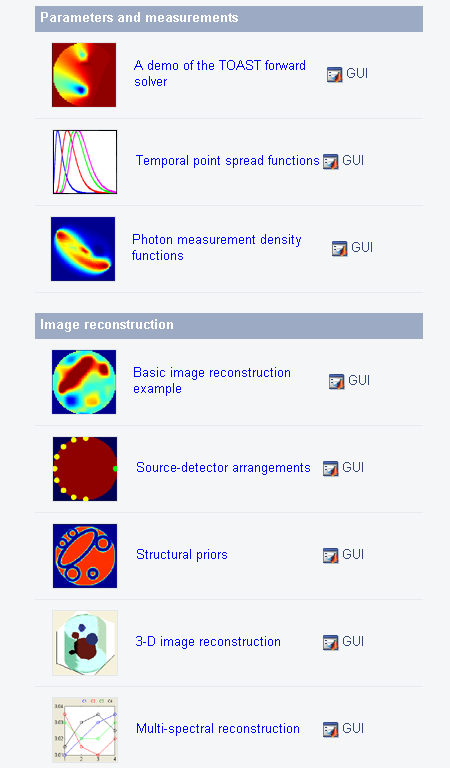 Application scripts which contain complete examples of forward and inverse solvers for optical tomography reconstruction problems. Help files, examples and demos. Matlab provides a development environment that allows rapid prototyping and is better suited for development, debugging and visualisation than the native Toast C++ code. The current interface makes use of Matlab class constructs for objects such as meshes and basis mappers. Most of the Toast functionality is available via class methods. A legacy interface is retained for backward compatibility with existing Toast scripts. It exposes the Toast functionality via top-level functions.